In this modern era of "ready to run" and "plug and play", Friends is pleased to offer you "not ready to run". These are rough castings for decades-old designs for your locomotives, which you machine and build yourself, in the tradition of the old days. The below pump(s) are from the original patterns and drawings; are "sand cast" near Boston, Mass. USA the old-fashioned way; and are offered here so that you might experience a "return to", or a "feel for", the "good old days". Machining and building such a pump will provide several hours of workshop enjoyment, and a 2019 (and beyond) "return" to the 1940-1980 era of the hobby. Allen Models' pumps, now available from Friends Models! 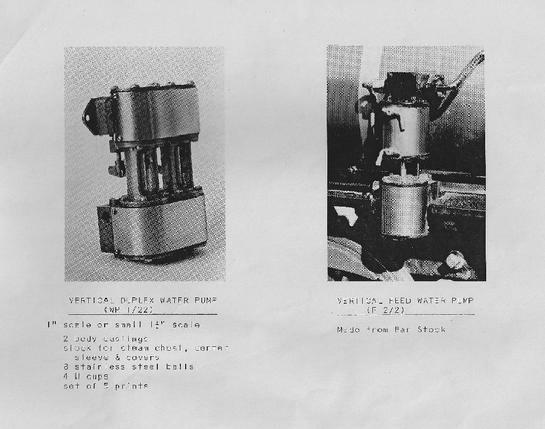 The Allen Models "Worthington" duplex pump. 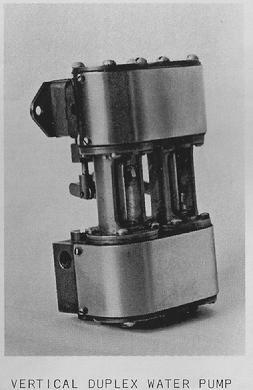 The Allen Models "Single" Westinghouse-style pump. Made from bar stock. "Single" type vertical pump includes drawing only. Pump made from bar stock. 1" scale or small 1-1/2" scale. The Yankee Shop "Duplex" steam-powered water pump for 3/4" scale, from about 1940. 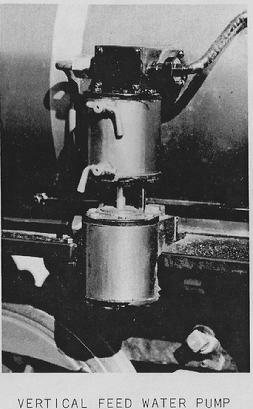 Based on, and similar to, the famous "LBSC" Donkey Pump, this was a Yankee Shop "standard accessory" in the early 1940s, built by many of the live steamers back then. It has been off the market for decades. It has returned so that you might have an interesting project to tackle, a useful accessory to place on your locomotive, and, to have a brief "feel" for 1940s live steaming. Valves are controlled by external "rocking levers". Includes water and steam castings, and the drawings. 8 stainless steel balls, 12 Viton O-rings, 8 stainless steel set screws, 46 hex head bolts, 2 lengths of round stainless steel, all needed brass stock (round, hexagon, rectangle, and 1/16" thick sheet), and a set of drawings.....are INCLUDED. 2-cylinder steam-powered pump for pumping water into boiler. Crossed ports, slide valves, no tricky shuttle valve or complex ports to machine. Designed by William S. ("Bill") VanBrocklin Jr. of Dover, MA. 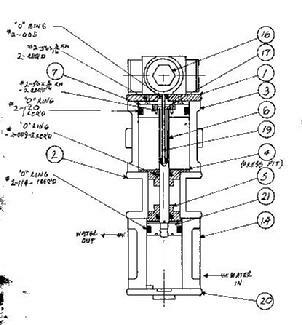 The 1" scale "duplex" water pump by Willam "Bill" VanBrocklin. Complete castings and materials package. Castings for the 1" scale VanBrocklin "duplex" steam-powered water pump. Made in USA and proudly offered by Friends Yankee Shop Models. The 1" scale VanBrocklin duplex water pump. Click on photo to enlarge. Two bronze castings, 1 steam and 1 water, plus a complete set of drawings and all needed materials and hardware, as formerly available from William (Bill) VanBrocklin. Castings are brand new, made in New England USA. The drawings are copied from Mr. VanBrocklin's inked originals as formerly available from Power Model Supply and from Mr. VanBrocklin. Tools required: 6" (or larger) lathe; mill-drill machine or small milling machine (or a good quality drill press with an X-Y milling table and a positive depth stop). A height gage (with scriber) for measuring and marking off the holes' locations, is recommended. Builder will need to supply his own displacement lubricator (not included). 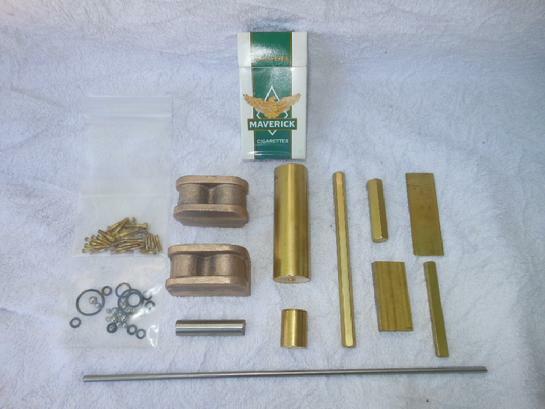 Balls, O-rings, screws, bolts, setscrews, and ALL MATERIAL (brass, stainless, etc.) is included. $275.00 plus $25 shipping to the USA; plus $70 shipping to Canada. For other countries, please inquire. If you mismachine a casting, replacements are in stock & available. To purchase, click the Paypal link below to pay with your Paypal account or your credit card. If you would like to pay by personal check, or by regular credit card (not through Paypal), please contact me for details. 1-1/2" scale Van Brocklin single-cylinder water or air pumps NOW AVAILABLE. Formerly available from Bill VanBrocklin of Dover Massachusetts; C.A. Street & Co. of North Carolina; and Power Model Supply of Missouri. These castings are made in New England USA from Bill VanBrocklin's original patterns. "Machine Your Own" in the tradition of the old days of live steam. Made in New England USA, using the old-fashioned "sand casting" method. A challenging project requiring skill and good workmanship. Great project for weekends or winters! Castings, drawings, & materials list included. Materials (metal stock, O-rings, balls, screws and hardware, etc.) at this time are to be supplied by the builder. (Friends will offer a "materials package" at a future time). Drawings copied from Bill Van Brocklin's originals. WATER PUMP includes: Valve Head, steam cylinder, & water cylinder (bronze castings). Complete drawings, and materials list. AIR PUMP includes: Valve Head, steam cylinder, & air cylinder (bronze castings). Complete drawings, and materials list. Click the images below, to buy castings for shipment to the USA. For shipping to other countries, please contact me. Thank you! "Rough Castings" in bronze, for the world-famous VAN BROCKLIN single-cylinder water and air pumps. 1-1/2" scale, 9-1/2" Westinghouse style. Cast in New England USA from Bill VanBrocklin's ORIGINAL patterns. Left to right: water cylinder, air cylinder, valve head, and steam cylinder. The elevation drawing of the Van Brocklin single-cylinder pump. Castings for water or air pumps, now available. Please click the image at left to purchase your Single-Cylinder Van Brocklin water pump castings. (USA Shipping). Contact me to make arrangements for shipping to other countries, thank you! Please click the image at right to purchase your 1-1/2" scale Single-Cylinder VanBrocklin Air Pump castings. (USA Shipping). Contact me to arrange for shipping to other countries. Thank you!